Check out the resources on the page's right side to learn more about breadth-first search. The video tutorial is by Gayle Laakmann McDowell, author of the best-selling interview book Cracking the Coding Interview. Consider an undirected graph consisting of nodes where each node is labeled from to and the edge between any two nodes is always of length . We define node to be the starting position for a BFS. 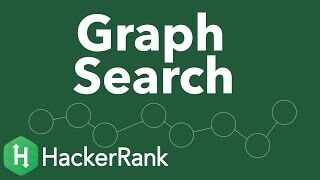 Given a graph, determine the distances from the start node to each of its descendants and return the list in node number order, ascending. If a node is disconnected, it's distance should be . 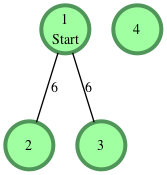 For example, there are nodes in the graph with a starting node . The list of , and each has a weight of . Starting from node and creating a list of distances, for nodes through we have . Define a Graph class with the required methods to return a list of distances. The first line contains two space-separated integers, and , the number of nodes and the number of edges. Each of the next lines contains two space-separated integers, and , describing an edge connecting node to node . The last line contains a single integer, , the index of the starting node. For each of the queries, print a single line of space-separated integers denoting the shortest distances to each of the other nodes from starting position . These distances should be listed sequentially by node number (i.e., ), but should not include node . If some node is unreachable from , print as the distance to that node. where our start node, , is node . The shortest distances from to the other nodes are one edge to node , one edge to node , and there is no connection to node . where our start node, , is node . There is only one edge here, so node is unreachable from node and node has one edge connecting it to node . We then print node 's distance to nodes and (respectively) as a single line of space-separated integers: -1 6. Note: Recall that the actual length of each edge is , and we print as the distance to any node that's unreachable from .